We value the support of our partner organizations. The Roxy is proud to work in connection with outstanding community organizations and businesses. Together we work to grow the Morton arts community. Representing the Centralia College system in East Lewis County, CCEast continues to meet the educational needs of thousands of people from eastern Lewis County. The college provides a wide range of programs as well as educational advising, tutoring, Running Start, and career counseling. Centralia College has been a major partner with Fire Mountain Arts Council in equipping the Roxy Theater and producing the annual summer production at the Roxy. Visit Website. The Morton Chamber strives to nurture an area atmosphere of good commerce in the City of Morton. They solicit desirable businesses for the area and work to enhance the very real tourism possibilities for the region. The Chamber and Fire Mountain Arts Council work together to provide information about the area and activities to visitors and residents. Visit Website. The dance professionals at Eatonville Dance provide a unique quality of dance for each student. A positive and professional atmosphere sets the foundation for each student to enjoy dance as they learn and grow in their individual abilities. The Tiller Arts Center hosts weekly Eatonville Dance Center classes. Visit Website. The Morton Depot Visitor Center is open to everyone looking for information on the surrounding area including but not limited to Mt. Rainier and Mt. St. Helens. The Visitor Center is part of the Cowlitz River Valley Historical Society complex. Visit Facebook page. Lewis County government works to preserve and enhance the quality of life in Lewis County through government leadership, service, education and administration. Lewis County helped enable the Roxy renovation and now provides support for tourist-friendly arts council activities. Visit Website. The city government works to provide needed and valued services promoting a sense of community in Morton. Staff and city council manage Mortonâ€™s long-range financial picture and balance city services. City lodging tax fund have helped support marketing for Roxy theater events. Visit Website. Vocal instructor Paul Brassey offers singing lessons at the Roxy Theater and has assisted with live productions. The East County Journal proudly provides east Lewis County with a voice and community service for over 65 years. The Journal is the one complete information source for nine east Lewis County communities. The Journal continues to be a major sponsor for shows at the Roxy Theater and through frequent pictures and articles shares Roxy excitement with their readers. Visit Website. Annually on the second weekend in August, Morton hosts the Loggers’ Jubilee. The Loggers’ Jubilee has become “the Granddaddy of all Logging Shows”and a celebration for people of all ages. From the Main Street Parades to the Lawnmower Races, the world famous Logging shows to the Jubilee Queen Coronation,Morton’s Loggers’ Jubilee promises a good time for all. 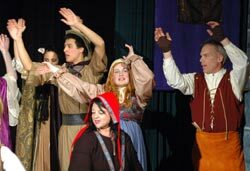 The many activities during Jubilee weekend include a live summer theater production at the Roxy. Visit Website. Discover Lewis County is a campaign and website designed to be a central resource for tourism-related events, sights, road trips and much more throughout Lewis County, Washington. Discover Lewis County is developed and maintained by Lewis County Information Technology Services. Visit Website. The Newaukum Healing Arts Center in Onalaska is the home to a local artisan gift shop, herbal apothecary, and Shady Grove Rejuvenation, owned and operated by Annie Bhagwandin. They host annual Midwinter and Midsummer Arts Festivals, featuring wonderful regional talent! Visit website.